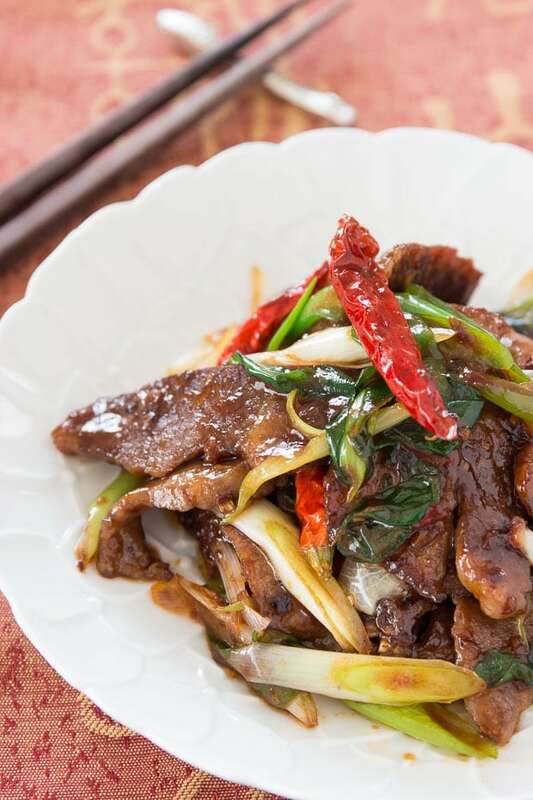 While not a Mongolian dish, Mongolian beef is a delicious Chinese-American classic with beef, garlic and scallions stir-fried with Hoisin sauce. I’ve been lucky enough to have had the opportunity to eat my way around the world in recent years, but that’s not how it’s always been. I grew up in a small agricultural community in Northern California and we rarely ate out. This was mainly due to the fact that my mom firmly believed in the healthfulness of wholesome home cooked meals, a belief that I hold to this day. Still, there were the occasional splurges where we’d order a pizza or take-out “Chinese” food. I always looked forward to these evenings, not because my mom’s food was bad, but because they seemed like windows into distant cultures that I didn’t have at home. As it turned out, they were windows into other food cultures, just not the ones I thought I was peering into. My two favorite dishes from our local greasy wok were Mongolian Beef and Singapore Noodles. Not only did the names sound exotic to my 8 year old ears, they were delightfully different from anything my mother would make at home. After leaving home and discovering a world of culinary wonders beyond the tight confines of my hometown, I was shocked to learn that neither dish comes from the countries they are named after. I was so embarrassed that I buried those childhood favorites, and for a time became one of those food snobs that obsesses over authenticity. Needless to say I’ve come full circle, and while dishes like Mongolian Beef may not be Mongolian (or even Chinese), they’ve become an authentic part of the Chinese-American culinary heritage. I’m sure there are at least a few of you shaking your head in disapproval over my last sentance, but may I remind you that if it weren’t for culinary abominations, we wouldn’t have dishes like ramen, the hamburger, and cronuts. If however you’re of Mongolian descent, I apologize on behalf of the Western world for misappropriating the name of your country for this dish. Having seen my share of food named “Japanese _” I feel your pain. For my version of Mongolian Beef, I like to marinate the meat in a mixture of chinese wine and oyster sauce. This builds a savory base, onto which the hoisin sauce can contribute its distinctive sweet earthy flavor. To spice things up, I add a bit of doubanjiang, a Sichuan chili bean paste which not only brings the heat, it also adds umami to the dish. Stir-fried with pungent garlic, spicy chili peppers and sweet scallions and you have a dish with a unique flavor that stands out amongst the long list of Chinese-American classics. 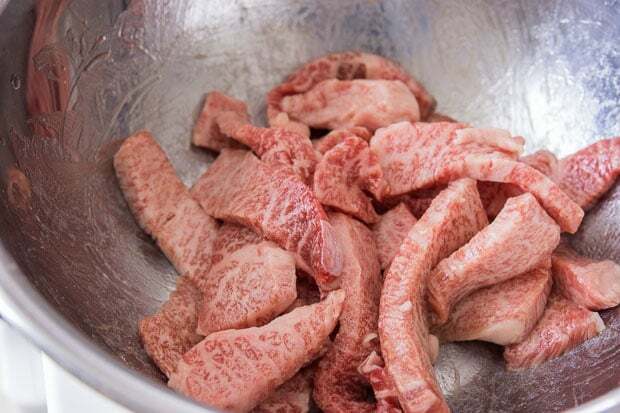 Put the beef in a bowl along with the 1 teaspoon of shaoxing, the oyster sauce and potato starch. Stir to evenly coat the beef and let it marinate while you prepare the rest of the ingredients. In a small bowl, add the hoisin sauce, 1 tablespoon of shaoxing, and doubanjiang, stir to combine. Heat a wok or frying pan until hot. Add the oil chili peppers and garlic and fry until the garlic is fragrant. 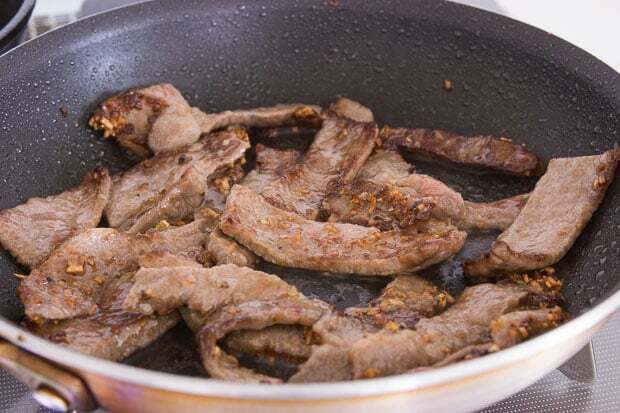 Add the beef and stir-fry until the beef is barely cooked through. Add the scallions and sauce and continue to stir-fry until the sauce has caramelized and coats the beef evenly (a few more seconds). 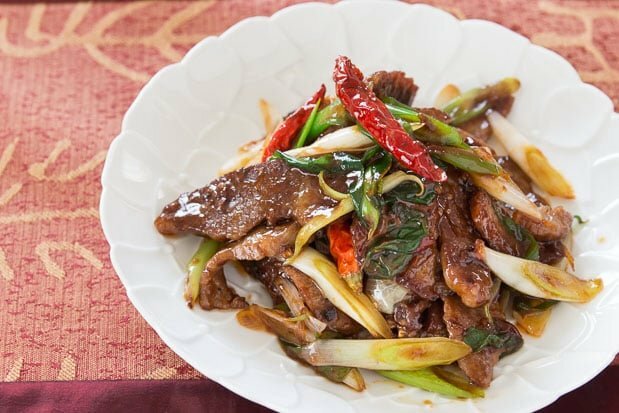 Serve your Mongolian Beef over fried cellophane noodles or rice. I am Singaporean and always wondered why I never ate ‘Singapore noodles’ back home. But whatever the food is called, they were part of our adventures and hold a speical place in our hearts. Okay, I have to ask. What cut of beef are you using there? Look at the marbling on that. It’s more white than red. Hi Drakenrahl, the beef was just labeled “scraps” so it’s unclear what cut it is, but judging by the shape and general marbling I’d say it was probably flatiron steak. So where does one get Shaoxing wine, if Shaoxing wine can’t be found what can be used in it’s place? Hi Tony, without knowing where you live, I can’t really give you any specific suggestions, but it’s usually carried in Chinese or Asian grocery stores. You may also be able to find it in larger liquor shops. As for substitutes, you could use a dry sherry as a substitute. Thanks for this fantastic recipe, can’t wait to try! Can you recommend a brand of doubanjiang? And could I substitute corn starch for the potato? Hi Julia, I can’t read Chinese so I’m not sure what the brand is, but it comes in a glass bottle with red label and black lettering. I know this describes almost all doubanjiang, but this one is very chunky with a little oil floating on top. As for subbing cornstarch for potato starch, it’s not a 1:1 substitution. Personally I don’t like the texture of cornstarch thickened foods (it tends to get more gloppy than when using potato starch), which is why I never use cornstarch anymore. I think it will be a dish tastes fragrant, sweet, and spicy. will be interesting to eat it. I hope it can be processed. Hi Tantowi, doubanjiang is a Sichuan chili paste made from fermented broad beans and chili peppers. It’s spicy, salty and earthy and can be found in any Chinese or Asian grocery store. It adds spiciness and umami, you could use another chili paste for the heat, but you’ll miss out on the umami.